Caterpillars are so cute, don’t you think? I think they’re adorable in nature, but I also think they make some really cute crafts. 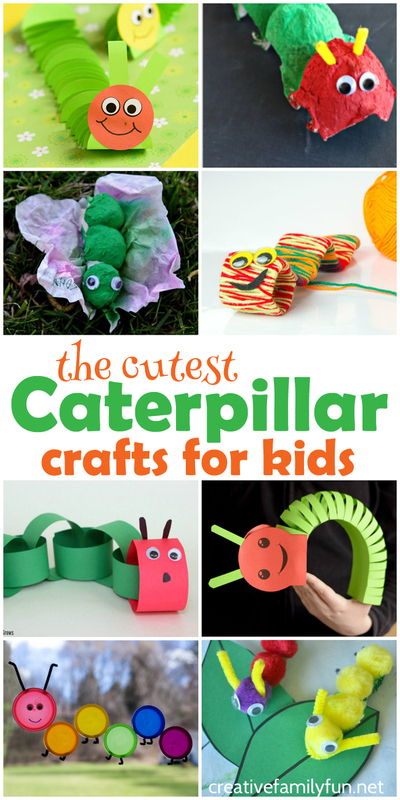 Here are the cutest caterpillar crafts for kids that I could find. Come check them out! You can choose a paper craft or one made from recycled materials. Grab the yarn or a supply of pom poms. You can even try growing a caterpillar! Whichever you choose, your kids are going to have so much fun with these crafts! Get out your supply of pom poms to make our classic Pom Pom Caterpillar craft. Use simple supplies to make this fun Caterpillar to Butterfly Craft from Mama Smiles. It’s so much fun to watch your caterpillar change into a butterfly! Combine gardening with crafting to make a cute Cress Caterpillar like this from Rainy Day Mum. Turn an egg carton into a super-cute caterpillar like this craft from Crafty Morning. Make your school supplies a little bit more fun by making this simple Caterpillar Pencil Topper from Crystal & Co.
Use your hand prints to make a happy caterpillar with this fun idea from Fun Hand Print Art. You can turn a paint stir stick into a cute caterpillar with this idea from No Time for Flashcards. Get out the paint to make these adorable Cork-Printed Caterpillars from Sight and Sound Reading. Make a colorful Caterpillar Suncatcher like this from Fireflies and Mud Pies. Make a caterpillar out of paper chains like this fun idea from Where Imagination Grows. Use paper circles to make this fun caterpillar from Easy Peasy and Fun. Create a yarn-wrapped caterpillar with this fine motor craft from Kids Craft Room. Make a cool 3-D caterpillar using this template from Easy Peasy and Fun. Use buttons to make a very cute caterpillar like this from Books and Giggles. 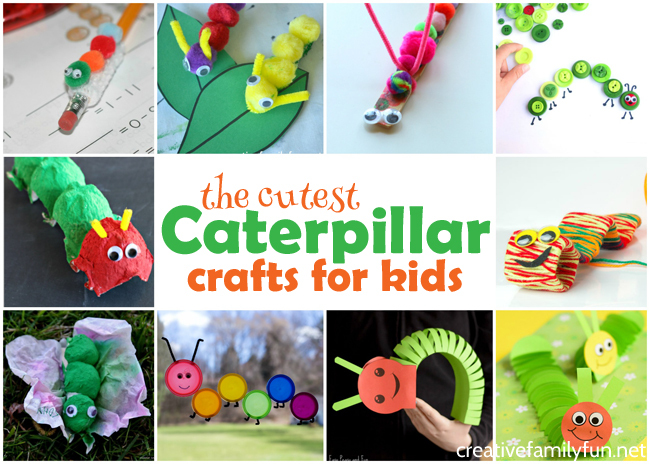 Which of these caterpillar crafts do you want to try with your kids? 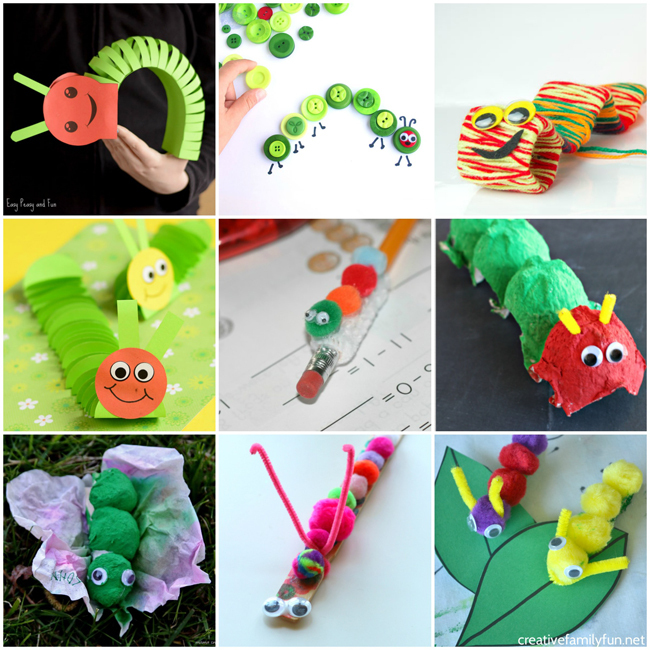 If you enjoyed these Caterpillar Crafts for Kids, the above photo is perfect for sharing on Facebook or you can save the photo below on Pinterest.